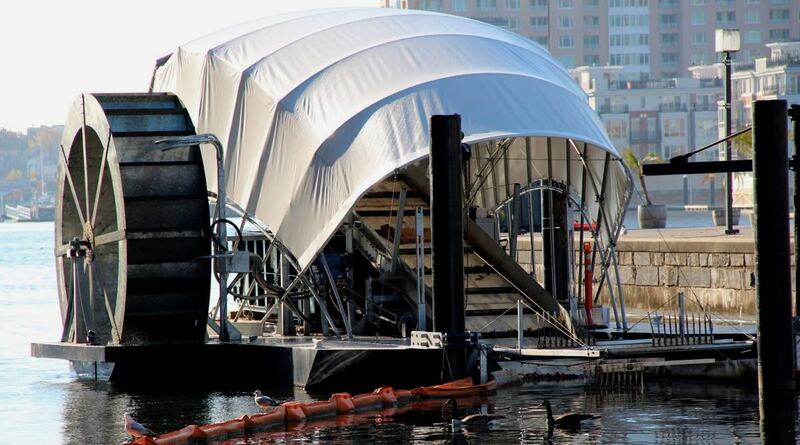 BRILLIANT - Simple and effective, John Kellet's river skimmer is a practical application of a water wheel and conveyor system to recover trash from the Patapsco river before it gets into Chesapeake Bay. The trash and other working parts are protected by a shade that also has solar panels facing the sun, as an emergency power store for when the river is not flowing well. 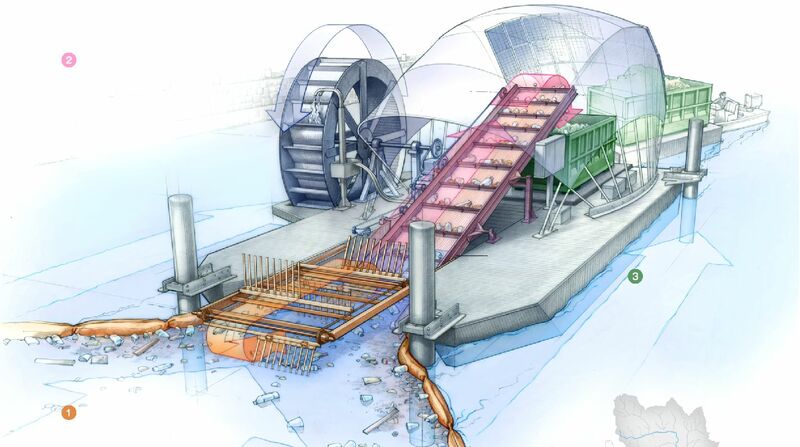 Based on a floating platform that is free to rise and fall with the tides, the water driven escalator system is fed by revolving forks that filter and lift waste onto a belt for deposit in a skip that is also floating on a pontoon. The idea is simplicity itself, provided that you have a site with flowing water and the space to deploy booms, that of course most moderate size harbors enjoy. Once installed, the skip needs to be emptied, involving manually replacing the one unit with another, having shut down the water wheel by putting the drive in neutral. What is incredible is the amount of waste this wonderful wheel collects, an indication of just how many people are careless in disposing of cigarettes, glass and plastic bottles and polystyrene containers. Many countries are now banning single use plastic is various ways that is likely to reduce river waste consisting of disposable plastics. Another way of reducing waste is to keep the public informed about the damage we are doing to our oceans, and providing more prominent litter bins. WATERSHED - Trash comes from people who throw garbage on the ground instead of putting it in a trash can or recycling bin. When it rains, water carries this garbage off streets and into storm drains, which flow unfiltered into neighborhood streams. These streams carry the trash into the Baltimore Harbor and the Chesapeake Bay. 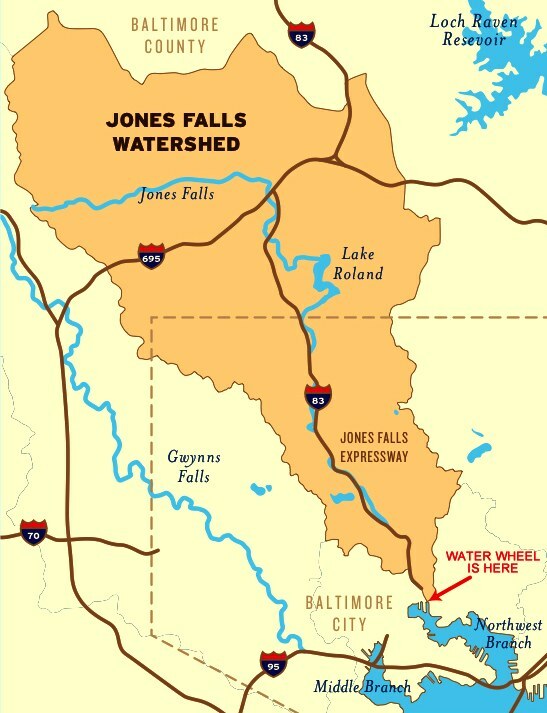 The Jones Falls begins as a stream in Baltimore County, and is fed by other streams until it becomes a small river in Baltimore City. Although much of the river is hidden beneath the Jones Falls Expressway, the Jones Falls Watershed is much larger than the river. A watershed is an area of land that all drains to the same body of water. 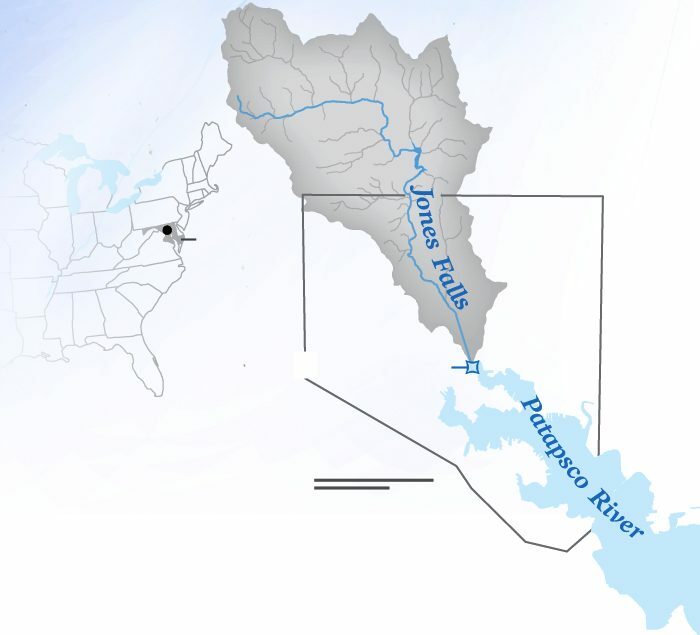 The maps above show the Jones Falls Watershed, which drains fifty-eight square miles of land. Garbage collected by Mr. Trash Wheel could come from anywhere in the Jones Falls Watershed area. 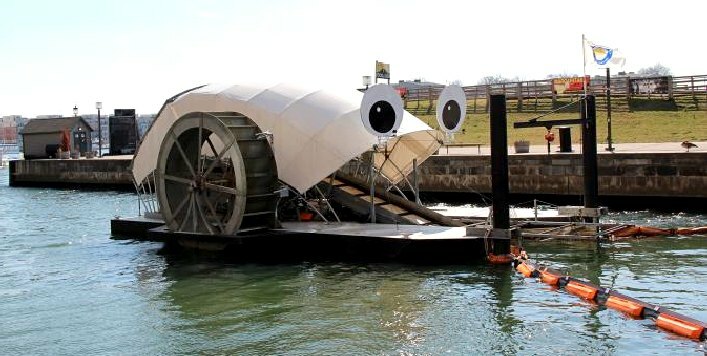 Baltimore’s harbor is cleaner than it has been in decades thanks to two anthropomorphic trash wheels pulling debris from its waters. Mr. Trash Wheel and Professor Trash Wheel, the latter of which was installed in December, are solar- and hydro-powered trash interceptors based in Baltimore's Inner Harbor, clearing debris before it enters the Chesapeake Bay. 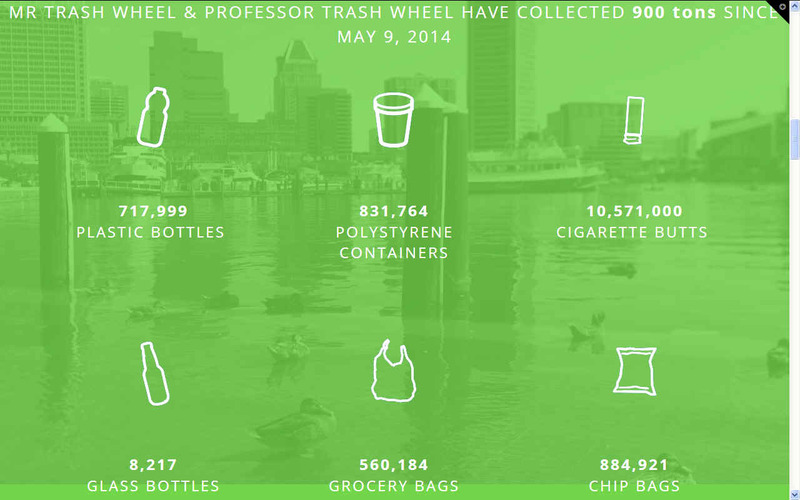 Over a million pounds of trash has been pulled out of the water by Mr. Trash Wheel since it was installed in May 2014. The trash wheel’s creator, John Kellett, worked on the harbor for years and saw garbage floating on the water every day. A sailor and engineer, he approached the city and offered to take a stab at cleaning up the harbor. He built a pilot trash wheel and installed it in 2008. 1. Uses all renewable energy, therefore fuel costs are minimized. 2. Effectively contains and collects debris at a single point before it disperses throughout the harbor, saving labor and effort. 3. Uses reusable refuse containers (i.e., dumpsters instead of disposable nets) thus reducing operational costs. 4. Incorporates high quality construction for durability and low maintenance costs. No one had ever tried to stop the trash before and the task seemed daunting. Kellett quickly realized he’d have to go bigger. The pilot wheel was often unable to pick up larger debris and had only one Dumpster, so when it was being emptied, the wheel had to wait for it to return before working again. Despite those hurdles, the Waterfront Partnership of Baltimore, a local nonprofit organization that works on the harbor, noticed a significant reduction of the amount of trash during the pilot program. The organization approached Kellett and offered to get the funds for a bigger trash wheel. The result was installed at the end of the Jones Falls River, which empties into Baltimore’s Inner Harbor. Besides the pilot, no other like it had existed. “No one knew what they were getting themselves into,” said Adam Lindquist, the director of Healthy Harbor Initiative at the ‎Waterfront Partnership. The contraption works by drawing power from solar panels and the current of Jones Falls River to turn a waterwheel, which in turn powers a conveyer belt. Containment booms direct the trash towards the conveyer belt, which then drops the debris into a waiting Dumpster. That bin sits on its own platform and can be floated out when it’s time to change it. Kellett keeps track of the garbage pulled out of the water. The haul includes almost nine million cigarette butts and over 300,000 plastic bags. The data is used to support environmental legislation. For example, the Waterfront Partnership recently supported a bill that would ban Styrofoam containers. Mr. Trash Wheel picks up an average of 14,000 Styrofoam containers a month, second only to cigarettes. The amount removed depends on the weather. The rain brings down trash from the Jones Falls watershed, a fifty-eight square mile area. Last June, 12 Dumpsters were filled during one storm. But only two Dumpsters were emptied during this mostly rain-free January. Seventy to 100 Dumpsters on average are filled each year. POWERED BY NATURE - The Inner Harbor Water Wheel, or “Mr. Trash Wheel” to locals, combines old and new technology to harness the power of water and sunlight to collect litter and debris flowing down the Jones Falls River. The river’s current provides power to turn the water wheel, which lifts trash and debris from the water and deposits it into a dumpster barge. When there isn’t enough water current, a solar panel array provides additional power to keep the machine running. When the dumpster is full, it’s towed away by boat, and a new dumpster is put in place. “If it rains, there is always trash,” said Kellett. The waste is most often common consumer products, but some unusual things turn up occasionally, like a live ball python—which the National Aquarium in Baltimore helped rescue— and a keg, which was returned for a deposit. Once, an acoustic guitar in pretty good shape turned up. Lindquist asked to keep that one. The trash is incinerated by the city to help generate electricity. Kellett said his team is also looking into a sorting method to recycle as much as possible. He sent several barrels of trash to BMW in Germany to see if the waste could be turned into car parts. So far, that hasn’t worked out. After a creative agency got involved and an online campaign was launched, the trash wheel got eyes and a social media presence. 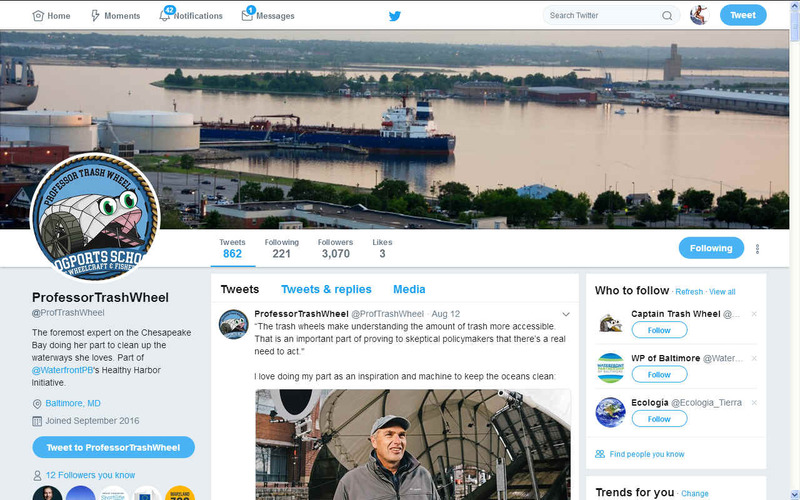 Now a video of Mr. Trash Wheel has more than a million views on Youtube and a Twitter account has more than 9,000 followers. “We did not foresee how positive the response was going to be,” said Lindquist. Kellett said he thinks the personification is “90 percent great” but there are drawbacks. But since it helps get people interested and informed, “it’s certainly a worthwhile trade off,” he said. Alice Volpitta, a water quality manager at Blue Water Baltimore, a nonprofit that does water testing and education, also has mixed feelings. “So many people are more interested in water quality issues now,” Volpitta said. Ideally, people would learn to change their behavior so there wasn’t a trash problem. Mr. Trash Wheel might be helping with that too, however. She said that at the pollution reporting public training sessions that Blue Water Baltimore hosts a few times a year, about 75 percent of people know about Mr. Trash Wheel. Until then, Mr. Trash Wheel is a stop on tours of the Inner Harbor. A sign on the waterfront explains how the trash wheel works. A public video feed is available online to watch what the trash wheel is picking up at any time. A local elementary school has come to the harbor to celebrate Mr. Trash Wheel with a decorated car tire as a stand-in for a birthday cake. 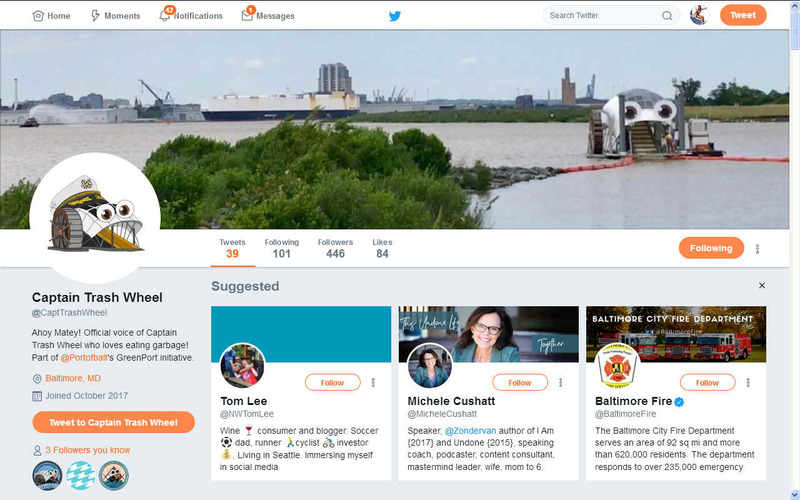 Mr. Trash Wheel tweets about support for the Styrofoam ban and topical events, like a recent post with the escaped bobcat from the National Zoo photoshopped onto the trash wheel’s platform. “We’ve brought a sense of humor to the environmental movement,” said Lindquist. The attention garnered by Mr. Trash Wheel helped raise funds for Professor Trash Wheel, which was supported by 600 groups and individuals from 36 states and a dozen different countries. 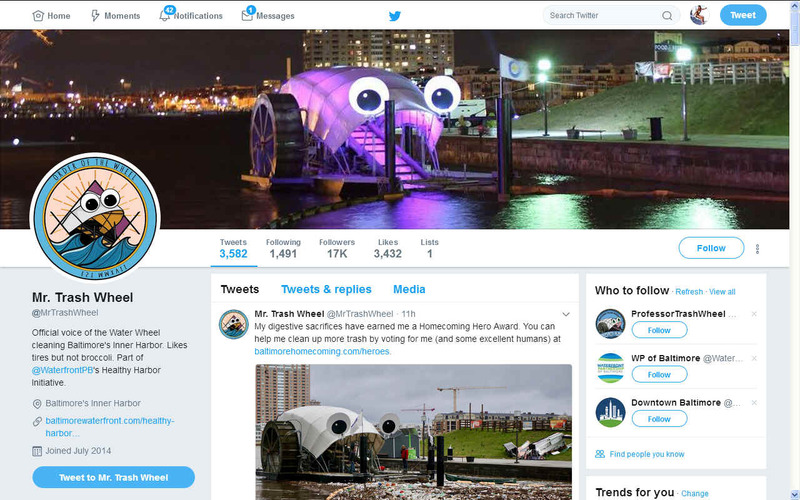 Located in a different section of the Inner Harbor, Professor Trash Wheel has the same googly eyes—plus eyelashes, as the professor is a “lady”—and a matching social media presence. Lindquist said they are hoping for one or two more trash wheels in Baltimore. Similar projects are likely to go global. Kellett, now with a construction company to build the wheels, has done site surveys in Lombok, Indonesia, Panama City, Rio de Janeiro, and stateside in Honolulu, Milwaukee, Atlanta, and Denver. “I get to go to great places and see the worst side of these places,” Kellett joked. Some adjustments in size might be needed and trash wheels in cold places might have to shut down when the water they sit in freezes over, but otherwise the technology could work in many waterways. Groups have asked about using the technology in the ocean in places like the Pacific trash vortex, but by that point, Kellett said, the debris is probably too diffuse.